From Woodstock to Central Park! 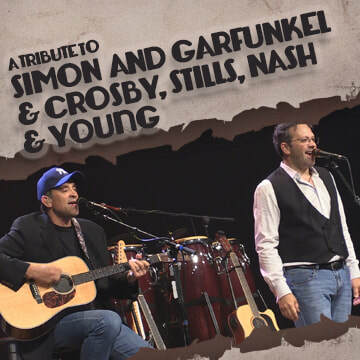 In one night - the music of Simon & Garfunkel AND Crosby, Stills, Nash & Young. When you think of Simon & Garfunkel, you hear angelic voices, incredible harmonies, and “sing along songs" known for decades. The Boxers bring back that timeless music and harmony in a performance that will have you singing along all night long. Double your pleasure with the Southern Cross tribute to one of the most dynamic bands of the 60’s & 70’s, CSN&Y! Close your eyes and allow the impeccable vocal harmonies of some of the toughest songs to perform (like the epic suite Judy Blue Eyes) transport back to the time of tie dyed t’s and bell bottoms. SOLD OUT IN 2017! The Boxers Promo Video 2016 from Todd Pitts on Vimeo. WOODSTOCK PROMO from Todd Pitts on Vimeo.